Long drives in the car can be uncomfortable and painful if you are someone who suffers with back issues. Truck drivers and delivery workers are just two of many professions that can include lengthy hours of sitting and even if you are only commuting to work, the position of sitting, hunched over at a steering wheel can take its toll. While car seats have certainly come a long way throughout the years and are meant to be ergonomic, they are unfortunately not designed for the shape of every person, and even the best crafted seat can be wearisome after enough time. This issue, coupled with the fact that most cars don’t have enough lumbar support, can be a recipe for disaster for those who already have back issues. Many chiropractors and orthopedic doctors suggest using a car seat cushion to give the extra support for your back that the car seat lacks. There are hundreds of car seat cushions on the market, with each type serving a different need and issue. Made from everything from beads to memory foam it can be challenging to know how to find the best car cushion for your specific back problem. That’s why we took a look at some of the top cushions out there to bring you the definitive guide to the best car seat cushions for long drives. Support: When shopping for a car seat cushion, look for one that provides a good level of support for your back and doesn’t collapse under the pressure and weight of your body. Whatever the material the cushion is made of, it should stand up to long hours of use and be just as supportive after a few hours as when you first sit down. Quality & durability: Since a car seat cushion can get a lot of use, look for one that is made of durable and quality materials that will last and stand up over time. The cushion should be covered with a strong fabric that won’t rip and the quality of the filling should be good and not feel cheap. Breathability: While it’s nice to have a comfy and cozy cushion, you might be doing a lot of your driving in the summer and you won’t want a cushion that makes your back sweat and makes you even hotter. A good car seat cushion for long drives should be breathable and wick away moisture from a sweaty back. Ergonomic shape: Whether you choose a car seat cushion that only cushions your seat, or if you are looking for a whole seat and back shape, a good car seat cushion should be ergonomic and fit the shape of your body. Contoured foam or man-made materials that follow the shape of the small of your back and support the lumbar region of the back will prevent your back from getting sore over long periods of sitting. Here are the best car seat cushions for long drives, based on overall quality, value and user experience. The Aylio Coccyx Seat Cushion has a unique seat design that features a cut out where your tailbone sits to relieve pressure off your lower spine, tailbone and hips. 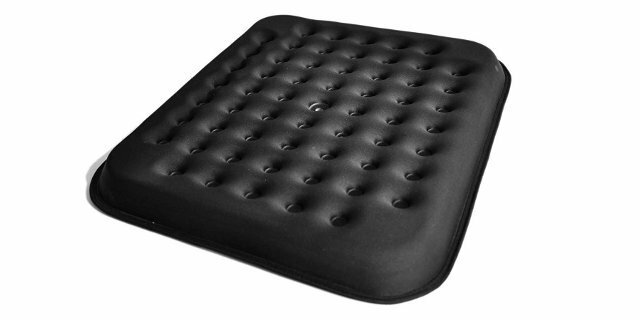 Specially designed to give relief to those with all sorts of back pain including sciatica and herniated disc, this cushion promotes even weight distribution and can even improve your posture. It works by allowing your tailbone to hover above the car seat rather than resting directly on it and so takes the weight off this area that is normally feeling the direct impact of car vibrations and bumps. A high-density foam makes up the interior of the cushion and its ergonomically shaped to match the shape of the buttocks, providing support on all sides. The soft velour cover can be removed and is machine washable. Fully portable, the cushion can easily move from your car seat to your office chair but we find that many customers buy multiple cushions so they can have one in their car and one for indoors. Other happy reviewers are reporting total relief from piriformis syndrome and sciatica that previously only cortisone shots could relieve. Customers who drive for a living are using this cushion for hours at a time while driving and mentioning that it doesn’t compress down into nothing. It holds its shape and remains supportive, all day. Whether you are experiencing tailbone pain in pregnancy, an injury or just old age, this cushion has an overwhelming number of positive reviews. 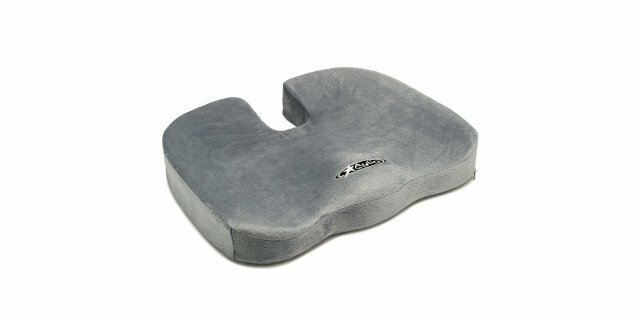 Customers that drive but have recently had hip surgery or a herniated disc are also reporting that this is the best cushion on the market. Aylio was started by a husband and wife team in the US. Wife Larisa is a certified occupational therapist and there is no doubt her background helped when designing the many products their company offers. Best of all, they offer a lifetime warranty on their products which makes buying this cushion a pretty simple decision. Similarly designed, the Everlasting Comfort 100% Pure Cushion has the same tailbone cut out as the Aylio model but is made from memory foam and so it molds to the shape of the body as it warms up. But unlike some memory foam cushions, heavier customers point out that this one doesn’t flatten down into nothing, even under a lot of weight. Instead it holds its shape and stays supportive and is wide enough to accommodate all shapes and sizes. And like the Aylio model, this memory foam cushion also comes with a soft and flexible cover that is removable for washing, which is great for customers spending long hours in their car and forced to eat while driving. Customers with disc issues or problems with leg numbness are also enjoying this cushion as the height relieves pressure off the back of the legs, promoting better circulation as well as taking off weight from nerves in the back of the legs. And some shorter customers appreciate the little height boost this cushion provides. While the Clever Yellow Car Seat Cushion has a similar tailbone cut out, the overall shape and style is completely different than the two previous models on our list and instead has a specially designed wedge shape. The idea behind the 3-inch-high wedge is to tilt the pelvis slightly, which in turn is meant to improve posture while relieving pressure on the lower back and hips. 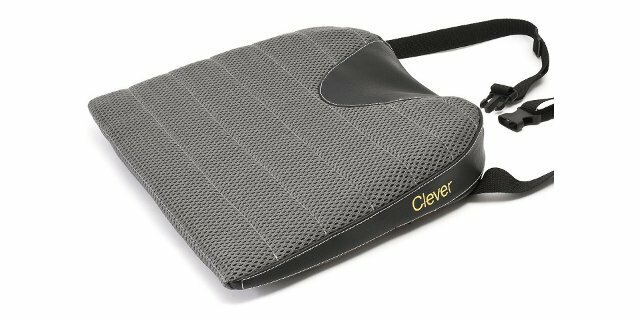 Designed particularly for driving, the Clever Yellow Car Seat Cushion has an adjustable strap that goes around the back of the car seat to keep it in place, but it could just as easily be attached to an office chair or used at home. Three-layer technology inside the cushion means it won’t flatten down over time and it includes dense memory foam and a molded foam core. The memory foam is covered with a mesh material on the outside, making it breathable and heat wicking during those hot days of long drives and the cover is removable and hand washable. Customers who use this cushion exclusively for long drives love how the adjustable strap ensures that the cushion doesn’t move or bunch around and that it isn’t too high, providing just the right amount of angle and height. Another customer with arthritis finds that this cushion is just what they need for their back problems. We also noticed that quite a few customers experience back pain due to the shape of bucket seats, particularly those who are a bit shorter. Quite a few people have found this cushion to give a nice boost and a decent amount of relief from car seats that don’t agree with their backs. 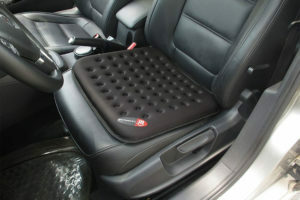 This is our choice for the best wedge style car seat cushion. A family business based in the UK, Clever Yellow cushions are sold exclusively online. If you find that you’re always hot in the car, or if you live in a hot climate the LoveHome Cool Gel Seat Cushion might be the best choice for you. A pad shaped cushion with no angles or cut outs, this cushion is great for those who want to disperse their body weight while sitting for long hours but need some extra air circulation. The divots in the cushion work as cooling vents and this is paired with a comfortable cool gel top layer and a Lycra Neoprene, water resistant, anti-microbial cover. A high density polyurethane foam makes up the lower layer of the cushion, keeping the cushions shape after long periods of use. And finally, the bottom of the cushion has a rubberized slip proof coating so it stays in place in your car seat. The LoveHome company is based in China and makes a wide range of cushions for lumbar support and seat and they have a no hassle, money back guarantee as well as a twelve-month warranty. Customer feedback is overwhelmingly positive with this cushion. One user with titanium screws in their back due an exposed sciatic nerve was finding sitting for any length of time problematic but they can now sit for hours at a time without pain. Another customer who has muscle pain in their leg when they drive for long hours uses this cushion and the pain has completely disappeared. Bringing yet another completely different design to our list of favorites, the Conformax Gel Car Cushion gives an option for those looking for full support throughout the seat and back. In fact, two separate cushions, the Conformax combo set offers a seat cushion with matching cushion for the back and so is fully adjustable, allowing the user to move the back cushion as high as they need to match their height or shape and style of car seat. The seat back cushion attaches to the head rest support pillars and has a lower strap that attaches to the bottom of the car seat. Both cushions are covered with the Conformax Airmax cover, a 2-way stretch, breathable mesh that provides good air circulation and wicks sweat. The gel layer inside the cushion makes the cushion comfortable but also stays cool during hot days or long periods of driving. 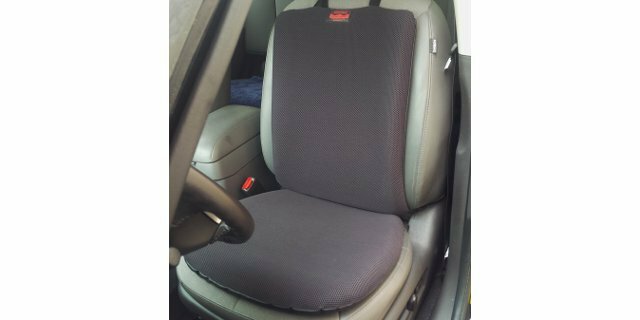 This seat combo has given a lot of assistance to drivers with lower back pain and customers overall are happy with the level of quality and the high-grade materials in this cushion. Conformax car seat cushions are made by the Onlygel company and they offer a thirty day “buyer’s remorse” return policy for any and all reasons. They also offer a 1 year warranty against manufacturing defects. They don’t import any of the gel products used in their cushions and they manufacture all of their products in their own factory in Southern California using all FDA or USP compliant ingredients. One of the most comfortable car seat cushions on our list. All their products are also phthalate and latex free as well as environmentally sound so you can be sure that your purchase is going to be safe if you have allergies, but also ethical. Prevention is worth an ounce of cure. A lot of sciatic nerve pain can be avoided through proper exercise and stretching. There are a number of useful videos that can show great stretches that specifically target the sciatic nerve. If you know you have a problem with sciatic nerve pain, take some time before a long drive to try a stretch or two and see if it helps to relieve your pain. Yoga can be useful for tailbone pain, and there are specific products for those with specific needs, like yoga mats for those with bad knees. There are some poses that target this area of the back that may provide some help. Take a break. If you drive for a living or spend a long time behind the wheel take a break every so often when you can by pulling over to a rest stop or gas station. Just the simple act of getting out of the car seat and standing every so often can do a great deal to relieving back pain. Check Your Position. Did you know there is a proper way to sit while driving if you are trying to avoid back pain? SportsInjuryClinic suggests that drivers should make sure that as much of your thigh is covered by the seat as possible but also to make sure that you aren’t sitting too far away from the pedals so you have to strain or reach too far. They recommend making use of being able to adjust the steering wheel so you can reach it with bent arms and if your car seta has an adjustable lumbar support, make sure it is in a good position to support the lower part of your back.